Like it or not, winter is coming for a visit. With any “expected” guest, a little preparation is in order. 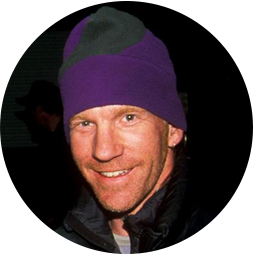 You need to make room for this cold-hearted traveler and all of the skis, boots, boards, sleds, ice axes, jackets, beanies, and other stuff he brings with him. In other words, it’s time to store your sleeping pads and sleeping bags for the winter season. Here are a few tips on how storing your gear for winter hibernation without compromising their next-season performance. Cleaning your mattress preserves its life expectancy. It’s your body oils that can bring on your pad’s early degradation. Often times, mattresses that are neglected and dirty also start delaminating. Through research, we’ve discovered that the fatty acids in body oils make the film beneath the mattresses’ fabric gummy. So how should you clean a mattress? Simple 409 does the trick. Or you can use a degreaser like BioClean All-Purpose cleaner. After spraying the mattress with a cleaning solution, wipe it down and then rinse thoroughly with water. Winter is the perfect time to make those repairs you haphazardly patched on the trail last summer. It’s easy to let it slide, but it sure is nice to have it ready to go. Check out this video for full instructions on repairing your pad. If you’re having trouble repairing a mattress, or you’re just not into the whole DIY thing, send us the mattress and we’ll fix it for a minimal fee. 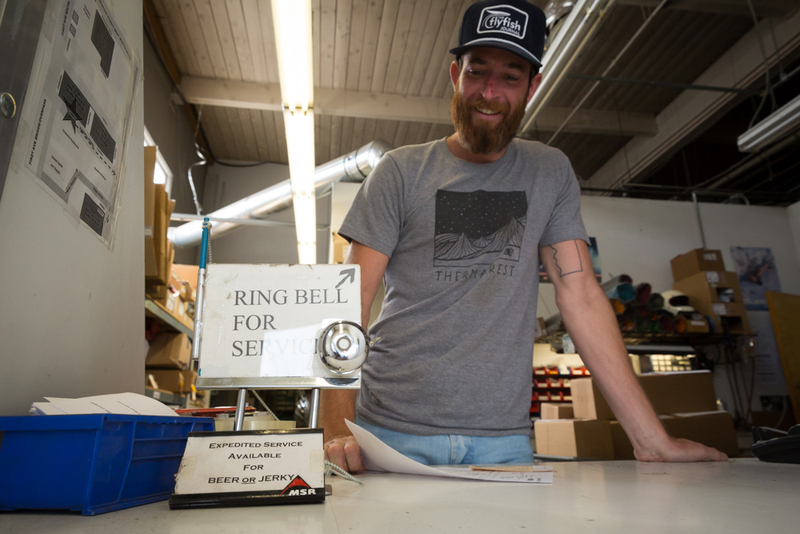 Here’s all the beta you need to get your mattress repaired by our professional team. 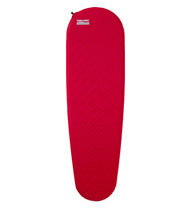 For our foam self-inflating mattresses, proper storage is essential for future performance. Keeping your mattress flat with the valve open is the way to go. 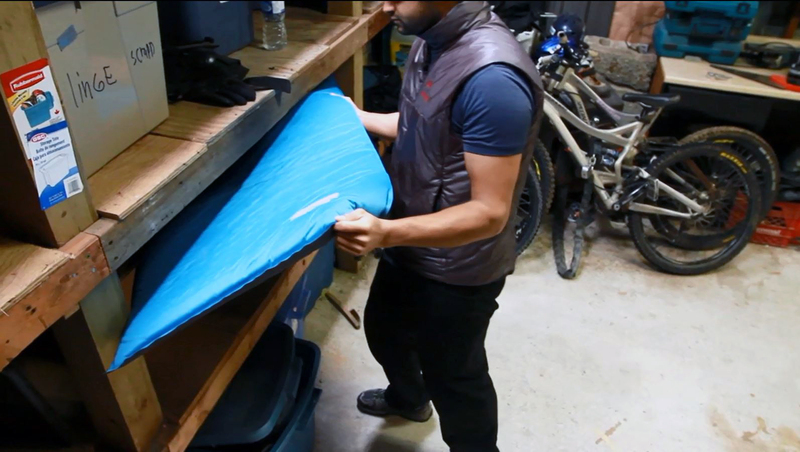 If you have an air mattress, simply roll it up tight and tuck it away for the winter. Pro Tip: If you’re struggling to find room to store your full-size, self-inflating mattresses, here are a few suggestions. For your summer-weight or three-season bags, blankets and quilts, wintertime means shelf time. But there are a few crucial steps to take before stowing your sleeping bags that will increase their durability and comfort. Washing your bag is more important than just improving your personal hygiene—not to mention your relationships with any future tent mates. In fact, by washing a sleeping bag, you’re essentially restoring the sleep system’s warming capacity by removing oils that, if left on, will decrease loft and insulation. But before you toss your bag into just any washing machine, know this: a top-loading machine with an agitator can destroy your bag. Use a front-loading washing machine (found at most laundry mats), non-detergent soap and run an extra rinse and spin cycles. If finding a front-loader proves difficult, there’s always the old-fashioned hand-washing method. If your bag is filled with Nikwax® Hydrophobic Down™ (used in all three and four-season Therm-a-Rest sleeping bags), we recommend washing the bag with Nikwax DownWash™ to maintain the bag’s water-repellant qualities. Standard detergents will leave water attracting residues on your down. DownWash will effectively clean the bag without destroying its Durable Water Repellent (DWR) coating. 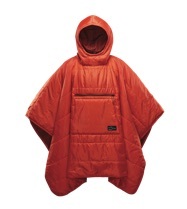 After several washes, however, you will need to restore the bag’s DWR coating using Nikwax Down Proof™. 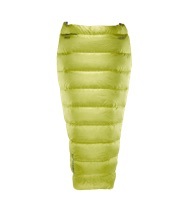 Low heat is crucial when drying your sleeping bag, otherwise, fabrics can melt. A large industrial dryer is recommended, and care must be taken so that the bag doesn’t expand and get stuck on the dryer’s heater. To do this, you can toss a few tennis balls in the dryer will keep the bag moving away from the heater, as well as break up down clusters. 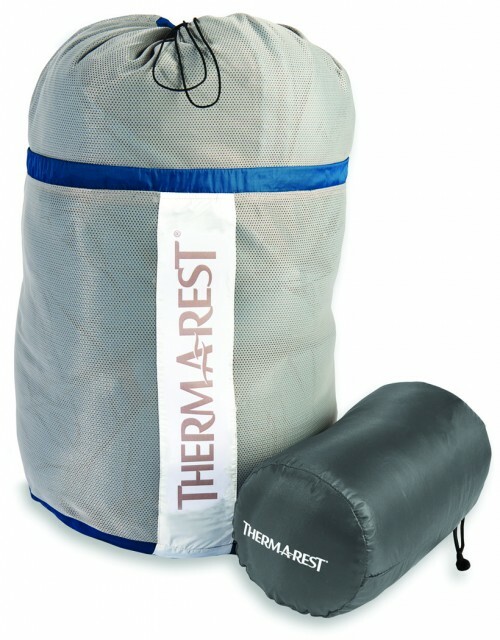 Therm-a-Rest sleeping bags come with two storing options, a stuff sack and a breathable mesh storage bag. We recommend using the storage bag over the winter because the mesh and larger size lets the bag breath and doesn’t compress its insulation. If you don’t have a large, breathable sack, we recommend hanging your bag, or simply leaving it unpacked (lightly folded will work). Again, the main concern is to not compress the bag’s insulation. Finally, make sure you stow the bag in an area that doesn’t experience warming/cooling cycles. If your garage gets really cold then really warm, those cycles may create moisture. Pro Tip: We also recommend turning your bag inside out and letting it soak up some sun for a few hours after a thorough washing and drying. The sun kills a lot of stuff you don’t want in your bag.